When I was younger I had problems sleeping and was awake at all hours of the night. This lead to very long days. 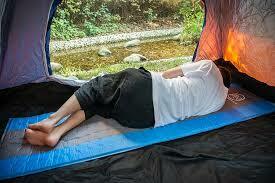 Recently I ran across an article that camping can help RESET your sleep cycle. I love to camp so this article caught my eye. Check it out for yourself. They say it takes just a few nights to reset your brain. Studies were done by University of Colorado Boulder with some very interesting out comes. I think most of the article makes great since. Sleep in important, don't you think? Let me know what you think of the studies.